I just spent 5 Days in Pinehurst, NC photographing a corporate event for a company based out of Atlanta. My office in Raleigh is only 74 miles away, so it was an easy drive to Pinehurst. 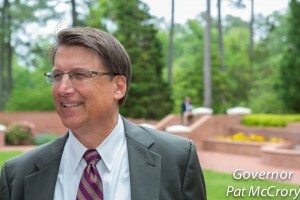 As you can see by the image to the right, I was able to photograph the Governor of North Carolina at the event. There were many officials at the event like the former Commander of the USS Cole Kirk Lippold who wrote the book Front Burner: Al Qaeda's Attack on the USS Cole. 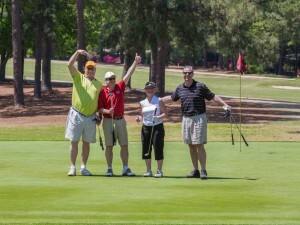 Corporate event photography is a core part of my business and Pinehurst is a great place to shoot a corporate event. No corporate event would be complete without a golf outing. As you can see by the picture on the left, this corporate event had some time included for golf. The lady with this group had just made a putt and everyone was happy. Part of being a corporate event photographer is being at the right place at the right time. It's my role as a corporate event photographer to tell the story through images. Whether you are having a corporate event in Pinehurst, NC or anywhere in the world, corporate photography is all I do. It's my true specialty and I absolutely love it. I fell in love with photography in the early 80's while still in High School. There is nothing else that I had rather be doing. My passion will show through in the results of the images that I create at your corporate event. The company that I shot for in Pinehurst is providing me with dates for 3 years out. So if your corporate event is scheduled for months out, don't wait until the last minute, please call me at 919.723.8453 or use the online contact form to contact me today.